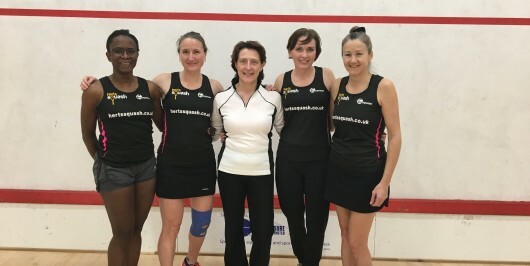 The ladies O40 team played their matches at Broxbourne Squash Club. They were supposed to be playing Cambridgeshire and Kent but unfortunately Cambridgeshire had to pull out of the competition. Therefore the team just had one match against Kent and unfortunately lost 4-1. There is still a chance for them to get to the playoffs as best runner up and so will be hoping for two wins in the January. The Ladies O50 team played at Colets in Thames Ditton yesterday. Nursing injuries they were hoping to beat one of the strongest teams, Surrey in their first match. Unfortunately, although great performances they lost the match 2-1, Maureen Morrison the only winner at No.2 string. They then went on to play Middlesex and won this match 2-1. So all to play for in a few weeks time when they will need to beat Hampshire to hopefully go through as best runners up.